This is the best Batting Tee made. You get what you pay for. The Pro X Tee is built to last and built to be portable. There is no better tee on the market. 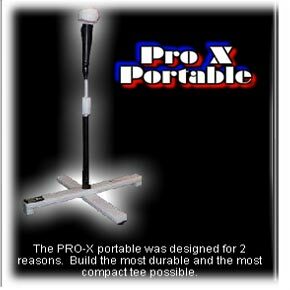 The Pro X Tee is the finest batting Tee on the market. The ball comes off clean and does not impend the bat. This tee is also built to last. Base is Guaranteed 3 years and the tee top 2 years. The Pro X tee breaks down into 2 parts... tee stem and X baseball good hitters know that tee work is very important. A great batting tee is a hitters work horse.